A running theme of my writing for the past month or so had been what I call the obvious Democratic strategy of drawing distinctions between themselves and Republicans. To that end, Congressman Joe Barton’s statement last week played right into their hands. Thanks to the deal President Obama inked with BP last week, the victims of the BP oil spill won’t have to go through what people whose businesses were ruined by the Exxon Valdez spill did: 20 years of litigation that ended with the Republican Supreme Court slashing the amount of compensation paid to them. To most people, this would seem to be an unalloyed positive development. But not to many Republicans. Okay, so far so good. Anyone looking at the oil washing up on Gulf Coast shores could agree with that. Well who cares what some Oil Patch Republican who is the largest recipient of oil money in the Congress says? Why is it relevant? Well, it’s relevant because this douchebag is the Ranking Republican on the Energy Committee. If the Republicans succeed in kicking out Nancy Pelosi, this guy will be the head of the committee that any legislation that involves energy needs to come out of. Yeah, accidents happen when you work in an industry that has lax regulations and even more lax enforcement; accidents happen when you lead your competitors by a margin of 760 to 8, 2 or 1 on “egregious, willful” safety violations; and accidents happen when you’re behind on drilling a well and you encourage your employees to take shortcuts to save the company money. Not to be outdone by Ron Paul in his defense of allowing corporations to abuse their power without the check of government, Sharron Angle, the Senate candidate in Nevada not only favors making Nevada the sole repository of nuclear waste in the country, but wants to abolish the Department of Energy, which regulates the storage of nuclear waste. If these guys have their way, the coastal waters of America would look like the coast of Nigeria, where some have estimated that they have endured the equivalant of the Exxon Valdeez oil spill every year for 50 years. Like I said, there’s something to be said for drawing distinctions and the Republicans did a pretty good job at that this week. Americans would do well to think about this when they go to the ballot box this November. They might not like Nancy Pelosi or Harry Reid, but would they rather have a guy who thinks we all owe BP an apology running the committee that sets the regulations for them? Would they rather have a guy who says that it’s un-American to hold BP accountable for their toxic oil spill? Would they rather replace Harry Reid with a woman who thinks, in the wake of the largest environmental history, that the EPA is unconstitutional? While the greatest environmental disaster in our history is a trying juncture for Obama, it also provides him with a nearly unparalleled opening to make his and government’s case. The spill’s sole positive benefit has been to unambiguously expose the hard right, for all its populist pandering to the Tea Partiers, as a stalking horse for its most rapacious corporate patrons. If this president can speak lucidly of race to America, he can certainly explain how the antigovernment crusaders are often the paid toadies of bad actors like BP. Such big corporations are only too glad to replace big government with governance of their own, by their own, and for their own profit — while the “small people” are left to eat cake at their tea parties. Rahm Emmanuel has long been pilloried by the Right for his statement that you should ”never let a crisis go to waste.” Well, this debate is long overdue. If the BP Oil Spill and the Casino-Capitalism-enabled Great Recession don’t provoke that debate, then the Democrats’ prospects for this years elections are even dimmer than originally expected. And we as a country will have succeeded in doing exactly that. Just a few months ago Harry Reid was all but left for dead in his reelection campaign. In February, he trailed the then Republican frontrunner, former Nevada Republican Party Chair Sue Lowden, by double digits. But the surge of Tea Party candidate Sharron Angle, Lowden’s much discussed gaffe on health care and consistent attacks on her by Harry Reid has shaken up the race and given the Majority Leader a glimmer of hope. “before we all started having health care, in the olden days our grandparents, they would bring a chicken to the doctor, they would say I’ll paint your house. As Lowden was being pilloried by the media and mocked online, Sharon Angle was racking up endorsements from the Club for Growth, Gun Owners of America and the Nevada Tea Party. Within a month, her support jumped twenty points in the fractured race for the nomination. She supports the privatization of Social Security; advocates cutting federal spending by hundreds of billions of dollars; wants to abolish the federal income tax and replace it with a flat tax, supports pulling the United States out of the UN and (by extension) giving up our veto power, wants to repeal the new health care law and ban almost all abortions. She thinks the Energy and Education Departments are unconstitutional, would get rid of Fannie Mae and Freddie Mac and would remove all campaign finance restrictions. She is in favor of nuclear storage at Yucca mountain, which might be the right stand for the country, but has been a third rail in Nevada politics for years and no candidate has won statewide in recent history with this position. Seizing the opportunity, Reid and his allies have gone on the attack against Lowden, but have refrained from attacking Angle. The strategy seem to have worked, as the latest polling shows Angle now leading by 7 points, with Danny Tarkanian and Lowden in a dead heat for the number two position. Clearly, Reid would rather run against Angle, but his strategy has had the double effect of weakening Lowden and increasing the chances that he will be able to run against a far right Tea Party candidate with positions way out of the mainstream. While Reid’s support hasn’t increased, the contest between the three Republican challengers seems to be paying dividends for Reid. He now trails Lowden and Tarkanian by just a few points and leads in a matchup against Angle. What happens on Tuesday is anyone’s guess. Primary polling is notoriously difficult to do, and 13 people are running in the race, but if Harry Reid gets his way, Nevada voters will have to choose from a Senator that they don’t like or a far right candidate that they don’t agree with. Either way, Harry Reid is looking less and less like a dead man walkin these days. More importantly, Nevada seems to be a microcosm of a process that is happening all over the country. As registered Republicans become a smaller and smaller part of the electorate and an increasingly paranoid group, Tea Party candidates are having more and more success in the primaries. In the cases where they can’t win they are pushing moderate Republicans to become more extreme (see McCain in Arizona). Like Jake Scully in Avatar, The Republicans were hoping to tame the dragon of the Tea Party and ride it to power in 2010 and 2012. Increasingly it looks just as possible that the Tea Party dragon will eat them for dinner. 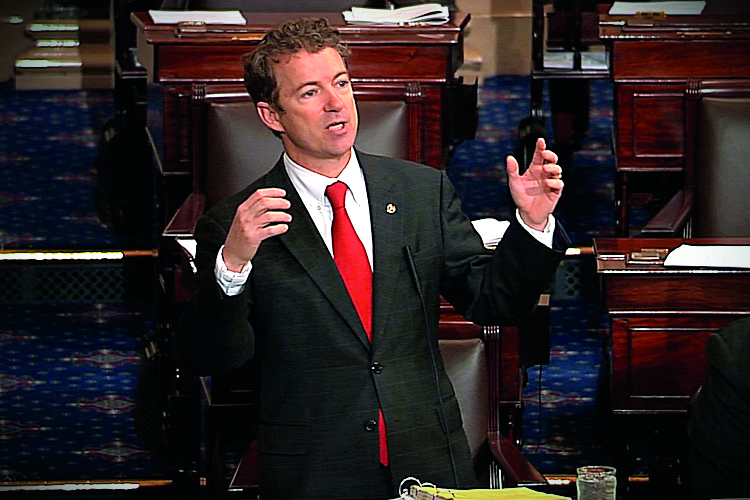 By now everyone has probably heard about Rand Paul’s tumultuous week. Frank Rich sums it up nicely here. If you missed it, the Rich article contains links to many of the essential parts. I suggest that you click on the Maddow link and follow it wherever it takes you (even to a defense of Paul from a conservative Christian group). In his acceptance speech, Paul defiantly tied himself to the Tea Party. “The Tea Party Movement is huge,” he said. “The mandate of our victory is huge.” Ignoring Tip O’ Neil’s maxim that all politics is local, Paul mentioned Kentucky just once and the Tea Party nine times. He followed up the next day with an appearance on the Rachel Maddow show where he said that he had some problems with the most famous civil rights bill in American history, the Civil Rights Act of 1964. So this is no “gotcha” question (as Sarah Palin (surprise!) said this weekend on Faux News). It’s a legit question on how he views the powers of the body to which he is running for. That being said, I have to disagree with many on the left’s characterization that this is mainly about race. I don’t believe that Rand Paul is a racist (at least I don’t have any evidence of that), but I do think that his “strict constructionist” view of the Constitution does put him way out of the mainstream and expose the reactionary views of many in the Tea Parties. Basically, this philosophy comes down to a view that the Constutution doesn’t allow the federal government to impose regulations on individuals or private businesses within the states. This is a fringe view and has been settled by the Courts for decades, which basically ruled that the Interstate Commerce Clause allows the federal government to enforce the Bill of Rights within the states. This may have been an end run around the Constitution at the time, but it has been accepted by a huge majority of people in the US (who don’t know anything about the Interstate Commerce Clause, but accept at face value that the Federal Government can enforce civil rights laws against busineses across the country who discriminate on the basis of race). Under pressure from the national Republican party, Paul has moderated, saying that he would have voted for the Civil Rights Act of 1964 and isn’t in favor of repealing it. Even the most right wing Republican Senators were quick to say that they shared this view. Since then, he has backed off a bit, saying on GMA that he believed the Fed’s had a right to set a minimum wage and cancelling his Sunday interview with Meet the Press, but he couldn’t resist one more wacky comment on Friday when he said that Interior Secretary Ken Salazar’s comment that his job was to keep his “boot on the neck of PB” was “un-American.” Given that a large majority of American’s probably believe that’s exactly where the Administration’s boot belongs after watching millions of gallons of crude oil spill into the gulf, it was a hell of a way to end the week. I have to say that I am dissapointed that Paul is censoring himself these days. I think the debate would have been good for the country. At minimum, it would make the Tea Partier’s question how far they want go with their strict constitutionalism and expose what the consequences of an America that hewed to strict libertarianism would look like. I’ll be interested to see how this plays out since there may be some agreement from the left on some of his policies (on military intervention and drugs). It will also be interesting (If he wins) to see how much his voting record differs from the hard line (American Taliban-cultural conservative) wing of the Republican Party. I say: Let Rand be Rand! The people of Kentucky deserve to know who they’re voting for and the American people deserve to know what this kind of unfettered free market capitalism and strict constitutionalism would look like. Plus, it’ll make for an interesting debate and the country could use one right now.